Told you it was simple! We have helped thousands of clients to have their UK and Irish documents legalised. We're so confident you can trust our service that we will refund your entire order if your documents are rejected. In fact we've never had a document rejected in China so this is a fairly safe bet for us. We offer multi-document discounts when we are legalising more than one UK or Irish document at the same time. If you need an individual quotation, please click on the 'Request a Quote' button below. 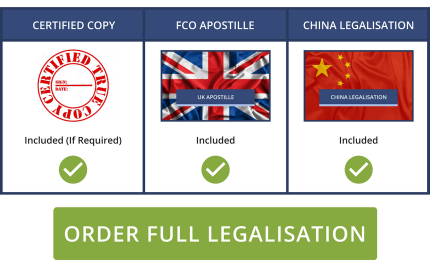 Using our Legalisation service for China will give you complete peace of mind and will ensure that you get what you need in a timescale to suit your needs. Certification by a UK Solicitor where needed (a Notary Public is not needed). In this case the work will be done on a certified copy rather than on the original, though can be done on the original on request. 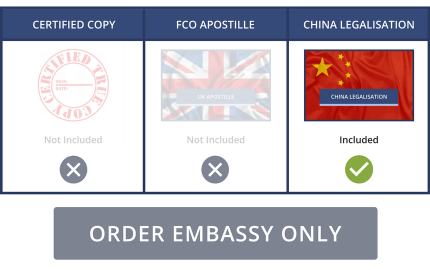 Being fully aware of what the Chinese Embassy in London need to make sure that your legalisation service is handled quickly and efficiently means you can sit back and relax knowing that everything will be dealt with correctly. If you have questions we have a specialist team ready to take your call NOW on 0330 088 1142 Alternatively you can fill in our enquiry form or contact us. Disclaimer: Due to unforeseen circumstances, Irish documents are taking longer to legalise. Please allow up to one extra week for the attestation of an Irish document.